Every other week or so Matt and I try to do a date night. In the past we’ve done mini-golf, kayaking, movies and breweries. We try to make it an activity so it’s not always going out for food. Personally, I love our outings because we try new things and it’s not always a budget buster. This weekend we added something new to our date nights with wine tasting. My knowledge of wines is solely based on my experiences in southwestern Michigan. I love all the vineyards stretching from about mile 10 through mile 40 on I-94. If you get a chance, I definitely recommend exploring the wine trail. But that’s for another blog post :). Our destination was Tasting deVine, located in downtown Wheaton. Tasting deVine is adorable and Matt and I are already planning our next visit. The storefront has a cute outdoor area where you can enjoy a sample, glass or split a bottle of wine with friends. On the inside there is a large bar for sampling as well as smaller tables for you to enjoy your wine. They also offer a small and large cheese and fruit plate to compliment your wine selection. The tasting room and tables were quite full when we arrived close to dinner time on a Saturday evening. So, we headed to an open spot at the bar and were greeted by friendly staff who walked us through our tasting options of Lynfred wine. Fun fact about Lynfred Winery is it is the oldest and largest winery in Illinois. 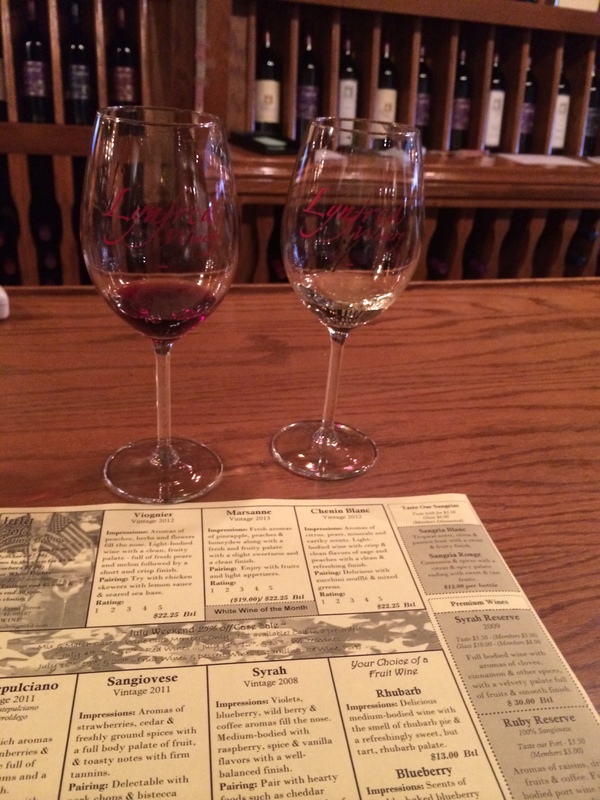 The winery is actually located in Roselle, Illinois but there are two tasting locations where you can also sample and buy Lynfred, the one in Wheaton and also in Naperville. Matt decided on a red sample flight and I chose a white one. We were given a menu of the three wines for our sampling that included descriptions and a pairing guide for meals. I tried to take a picture to remember what we sampled and one of the bartenders told me I could just take the menu. Yay for friendly staff! The staff elaborated on all the wines which was very helpful to learn more about them and the winery itself. My favorites were the Chenin Blanc and the Marsanne. Matt’s were the Sangiovese and Syrah. The samples change on a monthly basis so there is something new to look forward to. We had such a good time talking more with the bartender about wines and our experience with them, he encouraged us to learn more about their membership club. Before we knew it, we signed up to be wine club members! Tasting deVine has 5 different clubs to choose from. We selected the new release of the month club where members receive a soon to be released bottle wine which alternates between a red and white every month. There is no fee to the membership and you get discounts on bottles and cases as well as opportunities to attend wine club member events and special promotions. As you can see, it’s a good deal if you enjoy a bottle of wine. Maybe after a year in this wine club Matt and I will be ready to take on Napa Valley! Hi there! I am so glad that you had a fantastic time at Tasting deVine in Wheaton! I remember you guys from that Saturday (and I am glad you took my advice and took our wine tasting sheet)! My manager Beverly just told me about this blog and I just had to say how happy I am that you enjoyed yourself! Inside scoop – next moth’s tasting should be the following: Rousanne (think of it as the sister to Marsanne – a bit more delicate and with complimentary characteristics to the Marsanne), A Sauvignon Blanc, and a new Riesling (only a bit sweeter than the Chenin Blanc you enjoyed). Reds are tentatively going to be a Merlot (which I’m guessing will be a favorite for you as well since you liked the Syrah and Sangiovese), Petite Sirah, and a new one for Lynfred – a Dolcetto! Hope to see you two in again for next month’s tasting!